The Gifted community is filled with a diverse collection of beautiful individuals making their mark on the world as no one else can. 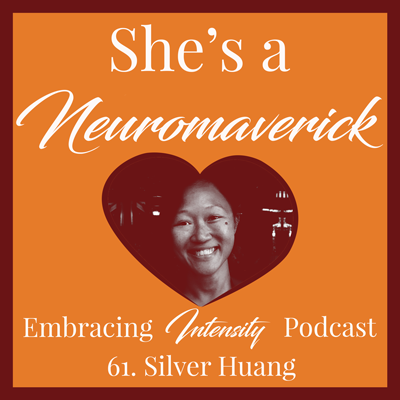 In an effort to showcase the cultural diversity as well as the neurodiversity within Gifted and Intense individuals, I came across Silver Huang, a self-proclaimed “Neuromaverick” who is working tirelessly to make the Gifted community aware and inclusive. Silver has been hard at work to embrace the very core of who she is, and is just now emerging from within her own personal revolution. For anyone who has ever felt atypical, out of place, or even out of touch with who they really are, Silver has a message for you! Listen this week as Silver shares her amazing journey towards self-love. Whether you are loving yourself right now, or simply coming to terms with your own intensity, Silver’s insights will speak right to your core. No one can stop you from being you except you. Your healing can begin right now. Silver’s life is incredibly different now that she knows about her Autism and Giftedness. Struggling with new diagnoses, trauma recovery, and a new sense of self all within the past year. Silver started an experiment that changed everything in three months. The amazing reconnection Silver experienced with her parents. Self-love and self-compassion allow us to see on the outside what we need on the inside. Silver’s views on integrity and authenticity. It is possible to be who you are as a Gifted person. The work it takes to heal our inner children. The cultural factors that limited Silver’s expression. Silver tried to “pass for normal,” and it destroyed her immune system. How we can grapple with and find community with other Gifted individuals. Intensity expresses itself in Silver through self-mastery. Digital apps and systems allow Silver to manage and support her brain. Silver describes her unique and sensational thoughts. We send love to the people who save our lives. We are not here to be liked. We are here to celebrate the expression of ourselves.